The publicly stated main task of the Economic and Social Committee (ESC) is to offer opinions on EU issues up to the Commission, Council of Ministers and European Parliament. It is mandatory for the Commission and Council of Ministers to consult this Committee on economic and social affairs before the relevant legislation is passed. 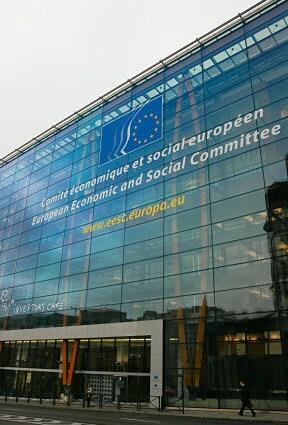 The ESC can itself offer reports and opinions on its own account if asked by other EU Institutions. The Committee members of the ESC are appointed by national governments for a four year term. Britain has 24 members and of these five are from trade unions and one from the TUC/ETUC office in Brussels. A further two trade union members take part in the Consultative Commission on Industrial Change (CCMI) formed in 2002. Responsibility for dealing with the ESC delegation from Britain and related matters rests with the Foreign and Commonwealth Office, supported by the Cabinet Office and the Department of Trade and Industry. The ESC has no power to block EU legislation. In other words it has what is called ‘influence’ only which can be ignored or shelved. Compare this committee of 344 with the estimated 15,000 to 20,000 lobbyists who daily persuade the law-makers in the Commission to favour their clients’ interests. Commission vice-president Siim Kallas, responsible for administrative affairs, audit and anti-fraud, has publicly estimated there are at least 15,000 lobbyists. It has been revealed that only 300 of these lobbyists had registered by 4 September with the deadline to do so being the end of September. The amount of money spent on lobbying can be gauged by that spent by large concerns. One report states that: "Spanish telecoms firm Telefonica…that its EU lobbying costs in 2007 were €950,000 (£800,000), while French car maker Renault says it spent between €200,000 (£166,000) and €250,000 (£208,000), and Air France-KLM reports between €50,000 and €100,000 (£41,000and £83,000).” ( 5.9.08) In other circles such quantities of cash would be known as ‘slush money’. If the ESC represents employers as well as trade unions and other interests in order to give opinions to EU Institutions, why the huge number of lobbyists and money? The ESC is a major part of the Social Partnership where organisations of employers and employees sit down together. It is clear that the ESC is one of the conduits to put across EU policies to the peoples and their organisations across the EU and bring the ‘EU closer to the people’ - these are stated objectives of this committee. The ESC is made to appear as though trade unions have some say in EU legislation but like the European Parliament the ESC has no powers - only influence. The effect is completely to undermine the real role of trade unions to better their members’ interests, including pay and conditions which do not coincide with the interests of employers who are out, to put it bluntly, to increase profits. Many EU policies in fact work against trade union principles and action is required to prevent any further attacks on hard won rights rather than cosy chats in Brussels with the employers and EU officials.